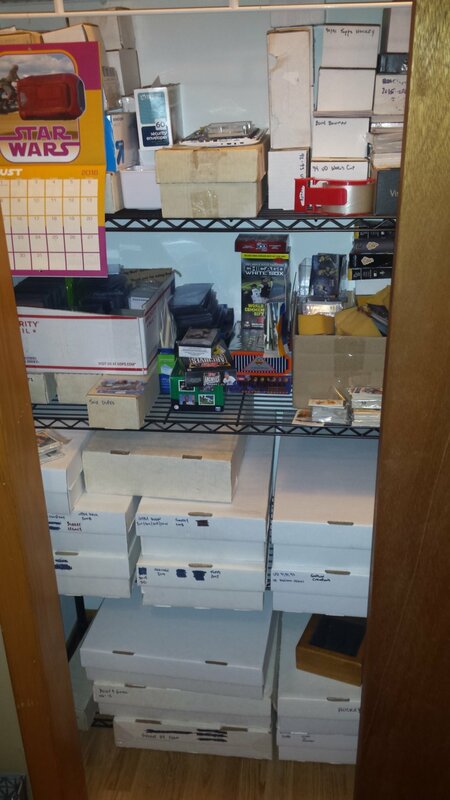 I'm not sure how I missed this, besides the fact that the past week of my life has been total sh*t crazy, but thankfully a post by P-Town Tom alerted me to a post from Judson over at My Cardboard Habit wanting to see the man caves/rooms/holes in the wall we get to ply out hobby within. And while I have a whole frigging basement that I could have as a man cave, soon my daughter and her man will be returning from school in Michigan, so we are going to turn the basement into a living area for them. Which means remodeling and getting a bathroom down there, cuz what I have is nothing but time and a WIDE OPEN to do list. So it appears my hobby will remain up in the smallest bedroom that is also my office, I guess. Since I work from home and all. And it's a mess (as everyone's is) and still a work in progress, as I have too many bare spots on the wall, but if you wonder why I am the way I am, maybe this will give you some insight. As I said, it's a small room. I believe it's 10x12 or 10x13 - something of that range. When you first walk into the door, this is the view across the room. That's my desk chair on the left and the window where I can see when the mail gets delivered. It is nice to have a window right next to your desk when working. I have a few things on the wall here as you can see. 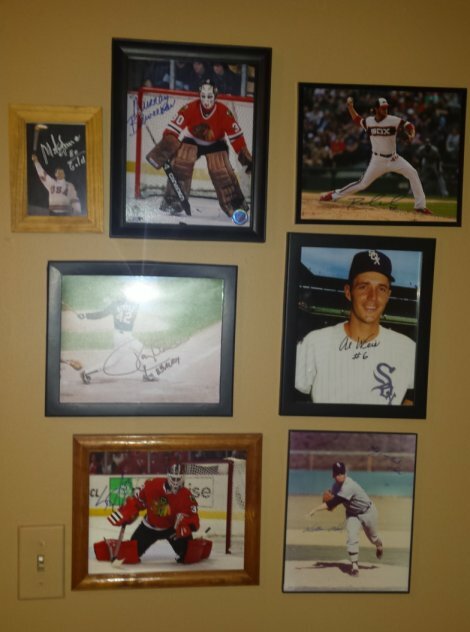 I framed a few relic cards, like Cal Jr jersey, other White Sox bats and jerseys. There is a Gretzky relic up there too. Also an ad from Wilson with Nellie and Aparicio talking about how they love their gloves when turning too. That black and white is a wire photo I got from ebay a couple years back. Nellie Fox was shaken up in a play at 2nd. 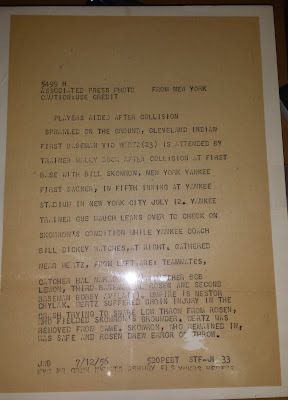 Hey - it was like 5 bucks and the original wire photo, with the stamp and information on the back, so I had to snag it. That chest of drawers is a work in progress. RIght now it's just junk storage. You can see a nice framed Patrick Kane autographed 8x10 I won at mt LCS at one pack war night. Love that thing. We'll get to the bookshelf and the closet in a little bit. Not the awesome sticker/photo collection on the side of the bookcase. I said the walls are somewhat bare, with too much empty space. But I do have some autographs around. Top to bottom we have a 5x7 of Mike Eruzione, Murray Bannerman, Daniel Webb, Ron Kittle, Al Weiss, Scott Crawford and Wilbur Wood. Correction - it's Indians vs Yankees from 7/24/54. 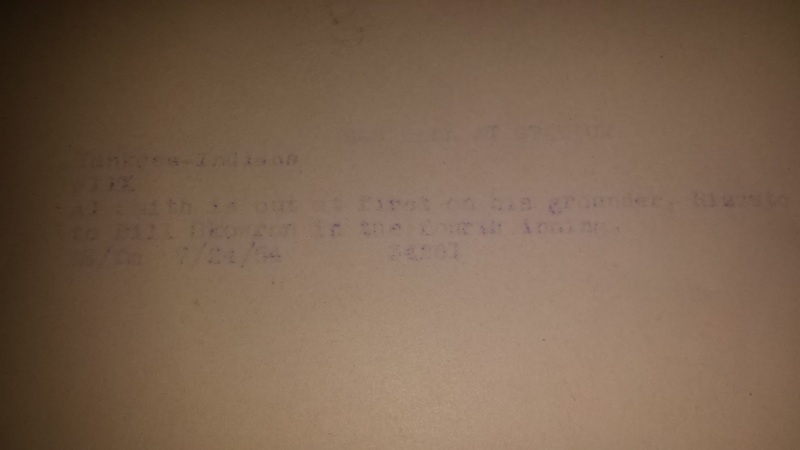 Al Smith out at first from a grounder Rizzuto to Moose Skowran in the 4th, according to the stamp on the back. 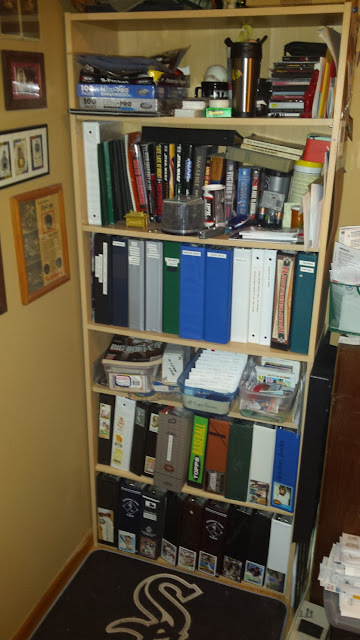 Just inside the door we have this bookshelf I just brought up from the basement for more binder storage. 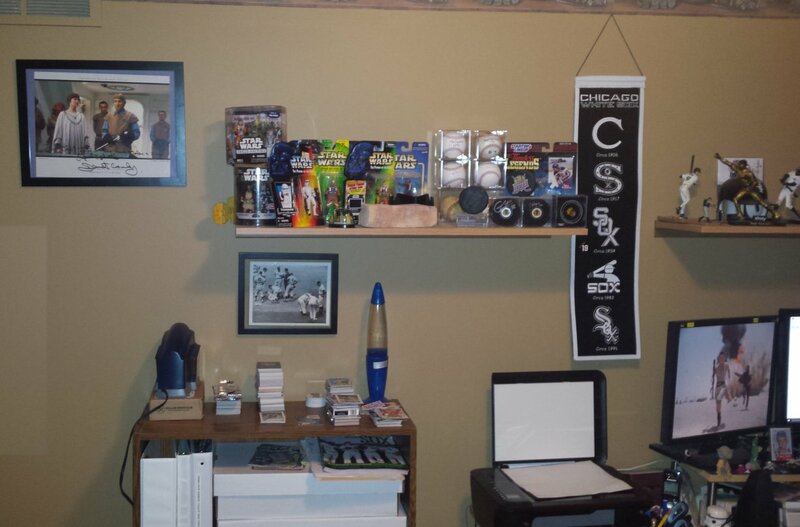 Above you see a shelf with autographs Star Wars figures, a brick from old Comiskey, autographs pucks of Jimmy Hayes and Colin Fraser, 3 autographed balls (Harold Baines, Billy Pierce, Jim Bunning) and a game used ball. Hidden behind that is a small hockey stick with autos of Chris Chelios and someone else - I can't remember nor make it out. My last wire photo his here, and it's another collision. No - I don't seek out the painful pictures. Just the cheap ones. Another one of Moose. Anyway - you can see the stacks of cards on the top of the shelf. Those need to be sorted into the correct trade/Sox box/Blackhawks box. Too much too be done. And no - don't ask about the lave lamp. How the hell to you dispose of one of them? Better look at the shelf. Just one binder has anything in it. I'm just starting to organize. There's the Upper Deck stool I won from a giveaway last year. People do actually win things! The Star Wars backpack was my daughter's Fathers Day gift to me. I need to get to a card show and break that mutha in. 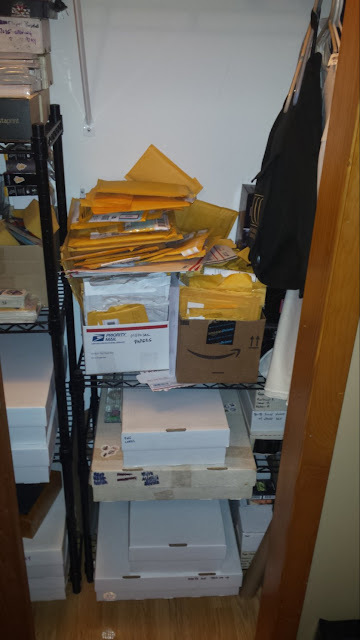 Lastly - that yellow mailer? Yeah - Canada. Get your heads out your hind ends so I can mail it! Yes - my router in on my desk. Yes, I need to mount it on a wall or ceiling. The rest of that wall and my desk. I have three monitors. I do not game. And some days I wish I had 4. There's my scanner and you can see a few stacks of cards underneath the monitor shelf. If you do not have your monitors on a shelf, you are fools. Soooooooo much more space for more clutter. Trust me on this. The White Sox logo banner was a few bucks at a store closing in the mall, so a no brainer purchase and fits perfectly between the two shelves. That 2nd one is McFarlane figures of Ichiro, Podsednik and Granderson, with some of the White Sox statue giveaways (Konerko, Pierce and Minoso). Also an auto mini helmet of Alexei Ramirez and a dvd with Stan Mikita's signature. The green thing is a seat back from Comiskey. 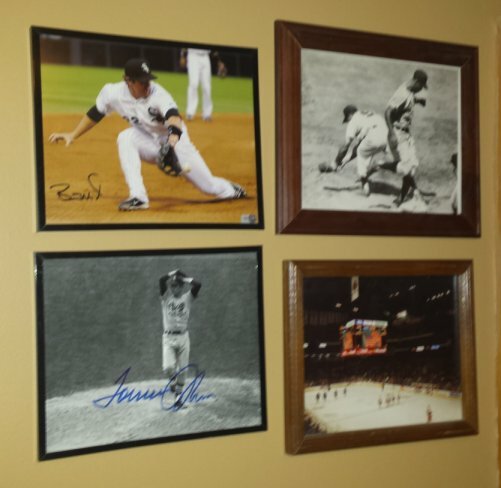 On the wall is an autograph of Brook Robinson and some cheap dollar store fake painting of the Iron Horse. Billy Pierce autographed card on the monitor shelf along with a buck of Lego minifigs and other silly, dust collecting items. Here's a better look at the first bookcase. 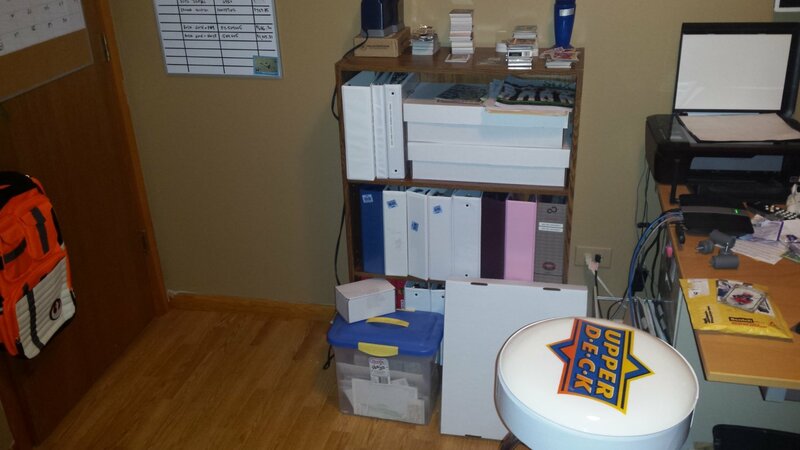 The plastic containers are, from left to right, packs for APTBNL (and yes, it is FULL), #Supertraders and blog traders. When I find a card I think would be good to send someone, into one of the two containers it goes, behind a labeled index card. When possible, I like using cards to label my binders, cuz I'm a dork and hey - why not. Who likes to read except weirdos!!! Couple notable binders: the gray/brown on shelf two is my auto and relic cards. The green right next to it is my '64 build. 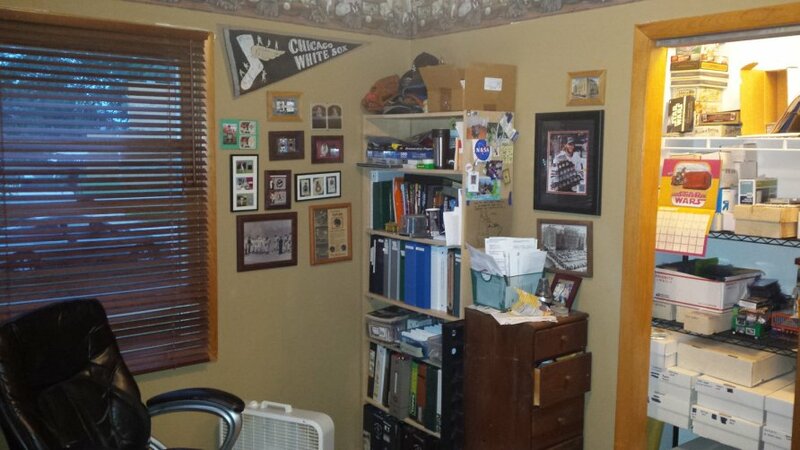 Just above the containers, on the far left is my Sox sampler and 2005 Project. The two bright blue side by side are Hidden Gems and Sox team sets 1950-1979. Supplies are at the top left. And bonus points if you can find the Arc of the Covenant. Two last pictures. Here is the storage closet. Large shoe boxes and 5k count boxes. I really like the 3 slot shoe boxes. Not sure why. But I label the sets in each box, so you can see the cross outs on a few when they moved to binders or another box. This is a 4 shelf blare wire unit I got on clearance at Menards. Love the thing. The oddball box on the shoe boxes is the current year trade box. I use that for this year's releases to help fill want lists. It's the box that gets emptied during Tis The Season. Shelf three (from the bottom) is supplies and stuff to sort. That USPS box? Nothing but frigging top loaders, mostly from a JBF bombing. Top shelf is empty boxes behind the Star Wars calendar. The right are small sets or other cards. Stuff I really should get rid of. The middle, yellowish box is White Sox and Blackhawks dupes. Other side of the closet. Because of that brace for the top shelf, I only can have a 3 shelf unit here. 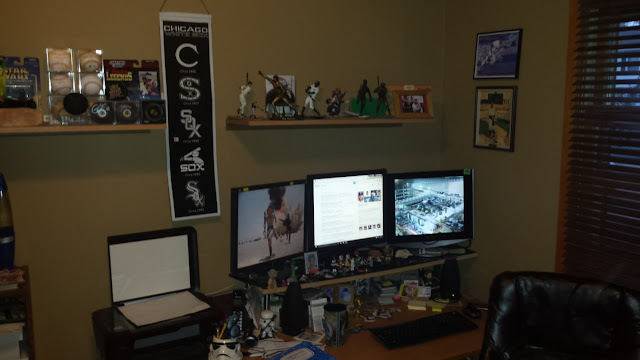 The bottom are the Sox boxes, though the large shoe box is about to be replaced with another 5k monster. Just above that are the trade boxes, sorted by team. Few other small boxes on the side. For those that get a mailer and realize it looks used, you can see why. I recycle all I can cuz a 50 cent mailer is 5 less cards you can pull from a dime box. Nick knows what I mean. Ok - that's the tour. I should do a 360 interactive stitching on all the pictures. Maybe Google Maps can drive through my house. Looks a lot more organized than my card room! I may have to whip up another one of these posts to update the one I did a couple years back. In my decade of trading cards online, I don't think I've ever bought bubble mailers new. Every single one I use is recycled, and I know I've saved a huge chunk of change doing that. Three monitors and you sometimes want four? Goodness! I have two at work and think I'm in heaven. Somehow, no matter how many monitors you have, sometimes you always want another. This is awesome! Thanks for the tour. Sweet! 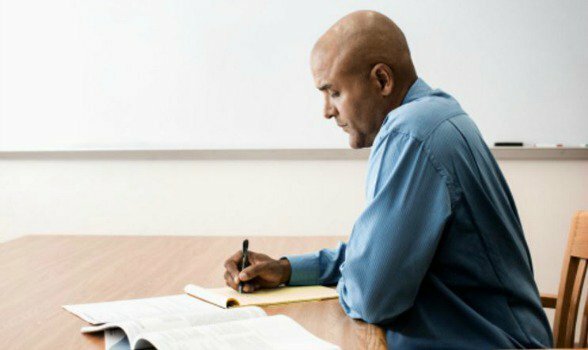 I'm jealous of the stool - I have yet to win a single contest. I'm just an unlucky SOB. Thanks for the tour! You have a great space. It's remarkable how closely your hobby room/office resembles mine. The difference being that none of my shelving units or wall shelves match. Oh, and I share mine with our cat. Cool tour...your space is immaculate compared to mine. 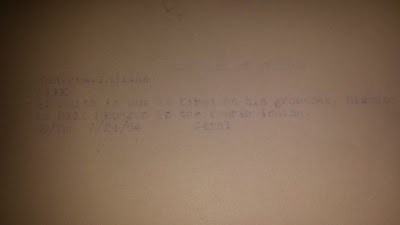 Thanks for the Archives cards you sent too!